The live.dial objects works like a circular slider that outputs numbers according to its degree of rotation. The number received in the inlet is stored and displayed by the live.dial object and sent out the outlet. The number received in the inlet is stored and displayed in the live.dial and sent out the outlet. 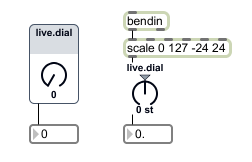 The word assign, followed by a floating point value, causes that value to be stored and displayed and sent out the live.dial object's outlet. If the Parameter Visibility attribute is set to Stored Only, the assign message will not add the new value to the Live application’s undo chain..
init Restores and outputs the initial value. (mouse) Click and drag in the dial to change the value. Hold down the Command key (Macintosh) or the Control key (Windows) for more precise mouse control. def. :1 Toggles the object's active mode. When the active attribute is set to 0, the mouse action does not cause output and the inactive colors are used. activedialcolor float Sets the dial color in RGBA format to be used when the active attribute is set to 1.
activeneedlecolor float Sets the needle color in RGBA format to be used when the active attribute is set to 1.
bordercolor float Sets the display color for the live.dial object's border in RGBA format. dialcolor float Sets the dial color in RGBA format displayed when the active attribute is set to 0.
focusbordercolor float Sets the display color for the focused live.dial object's border in RGBA format. needlecolor float Sets the needle color in RGBA format. This is only used when the active attribute is set to 0.
panelcolor float Sets the panel color in RGBA format. This is only used when the appearance attribute is set to panel mode. def. :1 Toggles the display of the parameter name. The default is 1 (displayed). def. :1 Toggles the display of the parameter value. The default is 1 (displayed). textcolor float Sets the display color for the live.dial object's text in RGBA format. def. :0 Toggles the display of a triangle in the dial display. When the triangle attribute is set to 1 and the triangle is displayed, clicking on it will restore the dial's initial value. tribordercolor float Sets the triangle border color in RGBA format. tricolor float Sets the display color for the live.dial object's triangle in RGBA format. float: Out right outlet: When an output is triggered, a raw normalized value (between 0. and 1.) is sent out this outlet. int/float: Out left outlet: Numbers received in the object's inlet or produced by clicking or dragging on the live.dial object with the mouse are sent out the outlet. The value sent is an integer if the Parameter Type is set to INT or ENUM.